Giants are enormous humanoids with a primitive, albeit very artistic, culture. They are very territorial, and will raise their clubs above their heads and shake them at you if you walk too close to their camps. If you continue to approach, they will stomp on the ground and become hostile. Giants are normally seen herding mammoths; if you hurt their mammoths or threaten them in any way, the giants will attack. Unprovoked giants are passive creatures. Giants' main method of attack is using their large clubs. Every time a giant uses a power attack with its club and the attack kills the targeted opponent, the victim will be sent flying hundreds of feet into the air, from where much of the surrounding landscape can be seen. This affects all entities, including you. Hostile giants refuse to enter water, and will eventually walk away if you remain in a body of water. Battling giants early game is an extremely dangerous proposition. Giants are level 32, and their mammoths, who are likely to aid their masters, are level 38. Their attacks, even if successfully blocked, can kill you in one hit. Early on, the best defense is dodging their attacks entirely. Attempting to kill them with melee attacks at this time is practically impossible. Giants can be ragdolled with all three words of Unrelenting Force, the Cyclone shout, a werewolf's moving or sprinting power-attacks, or a vampire lord's Vampiric Grip spell. These powers can make it a lot easier to defeat them in the early game. DGA werewolf can kill a giant with one sprinting power-attack. A magician can attack from afar with relative little fear of retaliation, using Frost spells to slow them down, or an archer can snipe them from a vantage point. The Command Animal power or Animal Allegiance shout can be doubly helpful when used to turn mammoths against giants, considering the mammoths would likely be attacking you otherwise. Exploiting the terrain by staying on cliffs where giants can't reach you can help survival rates, but be wary of their long weapon reach. You can also use big boulders to keep a distance between you and a giant, as you whittle down their health. Occasionally, you may encounter a giant leading a cow painted with symbols along one of Skyrim's roads. These giants will only turn hostile if directly attacked. Various groups of NPCs have been known to attack giants that have strayed too close to the road. Giants do not level up with you, but instead have their level set at 32. In contrast, most dragons in the game level up with you. Because of this, a giant can easily win a fight against a dragon when you are at low levels, and you can take advantage of this by leading a dragon to a giant to be killed. Be careful not to stay near the giant once the dragon is close or you may end up having them both attack you. It is possible to loot a giant's treasure chest right in front of them, as long as you don't stay near them long enough to turn them hostile. Frost Giants are added with the Dawnguard add-on. 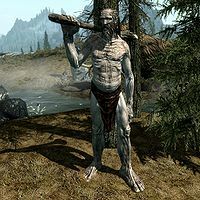 Karstaag, the spirit of a named frost giant, is added by Dragonborn. There are three different appearances for giants. Each appearance consists of a different set of animal hides and furs. The giant encountered at Pelagia Farm is slightly different from other giants. This giant has different health and only carries the unlootable club. Giants have one line of dialogue: "Ayarg garag gar! ", and it is untranslatable. The only named giant in the game is Grok. Jonah Lobe, the artist responsible for the giant model in Skyrim, created them to look like his father.